Earlier this year Hells Headbangers re-released an EP by one of USDM's most enduring bands, Incantation. Entrantment Of Evil was originally released as a 7" by Seraphic Decay Records in 1990 and then again by Relapse Records a year later. 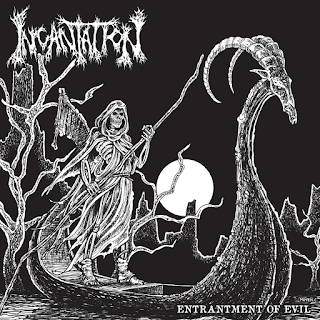 It holds a special place in Incantation's discography for being the only release that featured the vocals of Mortician's Will Rahmer. It's now been reissued on 12" MLP and features a special bonus track as well. 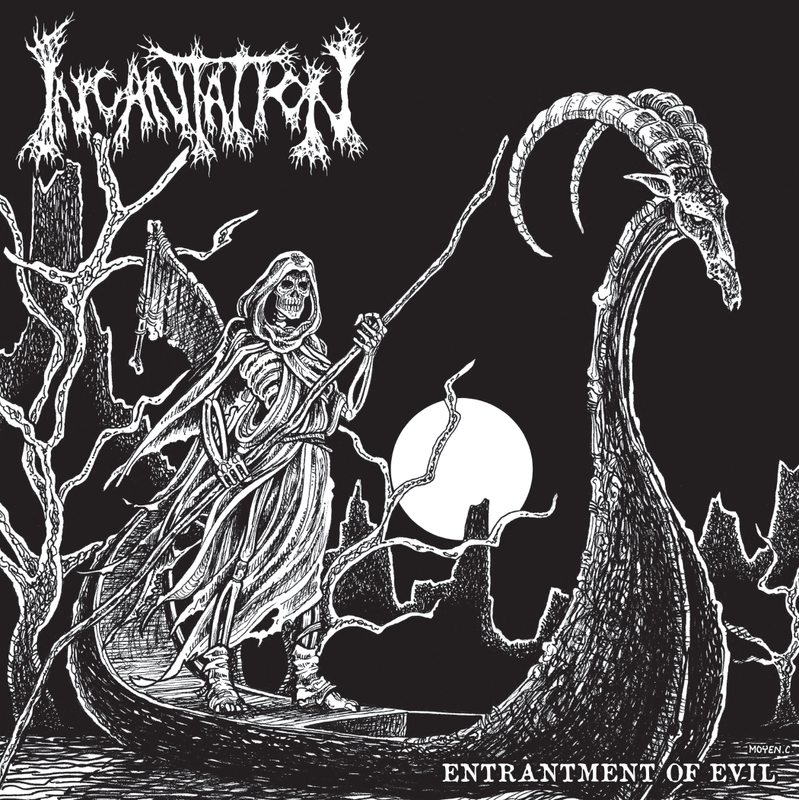 Incantation are going to be playing the Housecore Horror Festival in November and they are currently tracking for a new record next year, so it's perfect timing to unearth this early death metal gem! Alongside Swedish Death Metal, USDM probably has one of the most written about histories in the genre. Incantation helped to forge that history when they started out in 1989. Entrantment Of Evil was their first official release, featuring songs taken from their first two demos and now it’s available again thanks to Hells Headbangers. The first tat strikes you on the opening title-track is just how technical Incantation were, even in their infancy. The music itself switched between mid-paced and warp-speed death with deep growls and the occasional screaming solo. Eternal Torture contained a faint whiff of sludge and one hell of a foreboding atmosphere. The great about this release of the E is that is doesn’t take anything away from their original sound. It’s still as murky and as raw and it would have been then. The guitar is thick on Unholy Massacre, which grinds intensely throughout. They slow the pace down at times and groove their way through passages, but that doesn’t take away from the depressive feel. Their ability to change time-signatures without effecting the momentum of the song proves why they’ve become so enduring in the scene. The urgency of Devoured Death would have made it a great ending on the original 7”, but on the reissue there’s an extra surprise. The super-raw bonus track Profanation, which featured on Incantation’s original demo. It’s extra raw but is a nice addition for fans. An early artifact from one of death metal’s most prolific bands and one that people should check out if they haven’t already.